Whether your business is large or small, here are the ideas you need to hit the big time. Revealing the extraordinary, unusual methods of people who attracted the most money and attention to themselves and their businesses with the least amount of effort and time. 10 secrets used by such outrageous marketers such as P.T. Barnum, Richard Branson, Madonna, Donald Trump, Houdini, J. Paul Getty, Mark Twain, and Martha Stewart, among others. Use the time-tested secrets these tycoons, titans, and billionaires, to explode your business in 90 days! You cannot fail — 100% guaranteed! Use the time-tested secrets of tycoons, titans, and billionaires, to explode your business in 90 days! Whether your business is large or small, here are the ideas you need to hit the big time. In this new program, Joe Vitale reveals the extraordinary, unusual methods of people who attracted the most attention to themselves and their businesses with the least amount of effort and time. 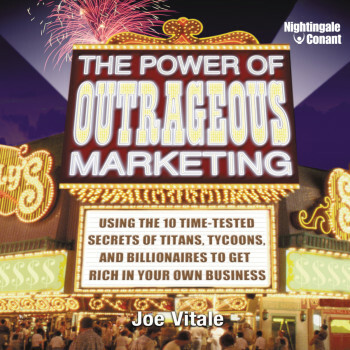 In The Power of Outrageous Marketing, Joe Vitale reveals the extraordinary, unusual methods of people who attracted the most money and attention to themselves and their businesses with the least amount of effort and time. He reveals the 10 secrets used by such outrageous marketers such as P.T. Barnum, Richard Branson, Madonna, Donald Trump, Houdini, J. Paul Getty, Mark Twain, and Martha Stewart, among others. The secret to reaching more customers without spending more money. Ten ways to use cross-promotions to explode your profits. Ten easy ways to grab attention for you or your business. The story of one man who became a millionaire with a single news release. A proven, famous seven-point checklist for improving your ads. Four tested ways to meet anyone you want. If you faithfully follow Vitale’s methods in The Power Of Outrageous Marketing, you cannot fail — 100 guaranteed!